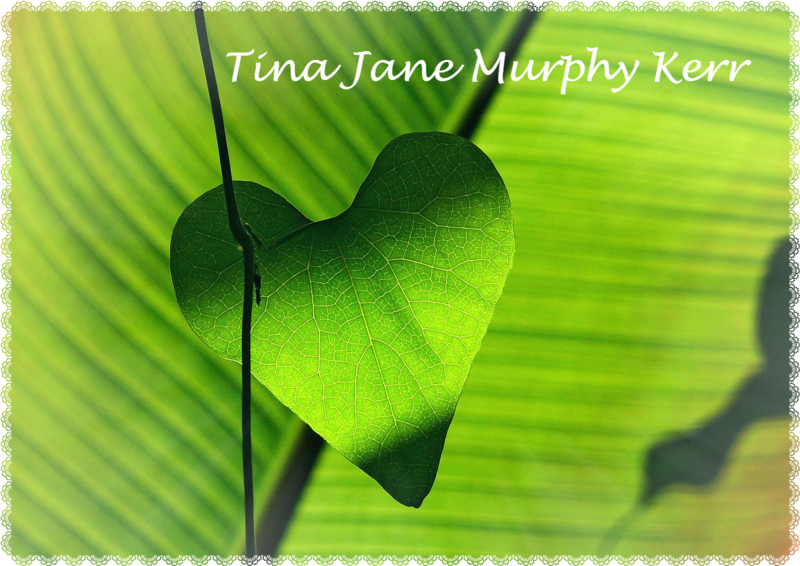 Tina Jane Murphy Kerr is a shadow right now waiting to have her story emerge. I know she was the mother of my great grandmother Ellen "Ella" Kerr Smith Dixon. Mothers are often called the heart of the family. Was she kind? Was she there for her daughter Ella when she needed her? Or was she something else. Was she the cause of why Ella left home? Of course I am assuming a lot here. In my post, Great Grandma's Name Was Ella. After That It's Complicated --Part three, I shared a 1900 Federal Census entry from Colly, Bladen County, NC that I believe shows an 18 year old Ella living with possible relatives. Why wasn't she at home with her mother, Tina? Perhaps it was for economic reasons to help out her relatives? Or perhaps it was to help send money back home to her parents? When I think of my 2nd great grandmother my thoughts tend to meander around my mind and more questions arise. What did she look like? What was the relationship like between she and my 2nd great grandfather Henry Kerr? For now, I can only catch a glimmer of who she was from the censuses. Based on information from the 1900 Federal Census, Tina Jane Murphy was born in March 1852 and married Henry Kerr in 1877. Her birthplace was more than likely in Sampson County or New Hanover County, NC. I have located her for sure on the 1880 census and that marriage date of 1877 seems to make sense based on the ages of her children in 1880. Could Hayes Murphy who's listed living next door be a relative, perhaps a sibling? Still trying to figure this out. There are other Murphys listed in the census near the Kerrs in 1880. I bet that some of these are kin of some sort. I may have located her in 1870 in New Hanover County, NC one county over but I am still trying to verify if this is her or not. I have an arrow pointing to who I think might be Tina. She's been referred to as Tena, Tina and Jane in records that I've found so far. Perhaps this is her. If it does turn out to be her than wouldn't it be interesting if the "Ceyla" noted in the same househould here turned out to be Celia Robinson. Celia Robinson was listed as the head of household in the 1900 Federal Census entry in Colly, Bladen county that I mentioned in an earlier post. Ellen Kerr was shown to be living with Celia Robinson and her family. That's just me speculating though. Anyway for now, I know that Henry Kerr and Tina Jane Murphy had at least 6 children together. The names of the five I've been able to identify so far were Henry, Murchison, Ida, Emma and of course, my great grandmother Ella. 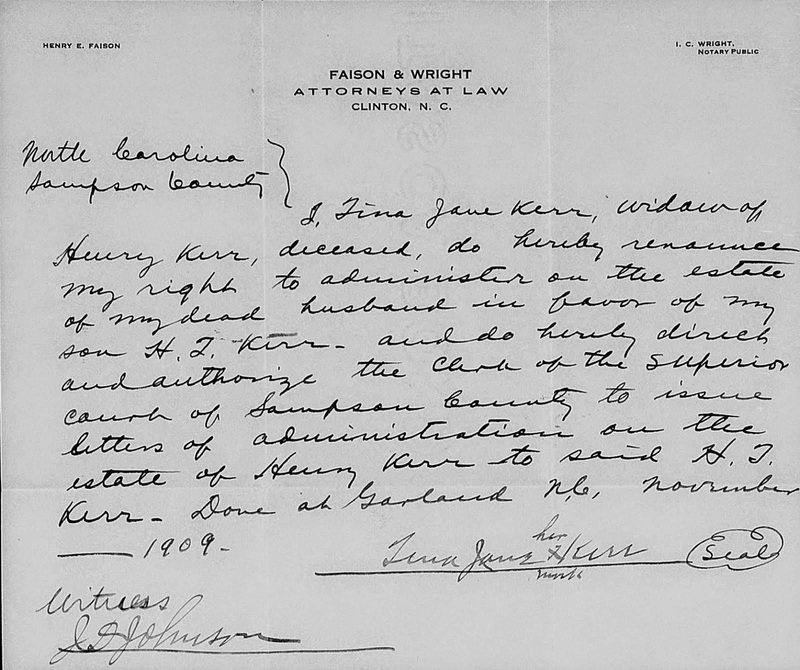 When Tina's husband, Henry Kerr passed away in 1909 she renounced the right to administer his estate and gave permission to her son Henry Tupper Kerr to handle things. It appears she wasn't able to write, since she marked her signature with an "X." The last record, I've been able to find on my 2nd great grandmother is a 1910 Federal census entry where it shows Tina residing with her daughter Ida still living within Franklin township in Sampson County, NC. As I do more research, I hope more will be revealed about Tina's story. 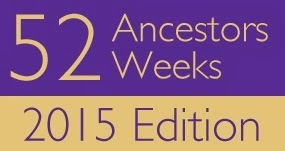 Announcing 52 Ancestors in 52 Weeks: 2015 Edition. It's the same with me -- the more I learn, the more I want to know and the more questions I have. And there's always another question, right? :) Thanks for stopping by Wendy.